(Updated March 17, 2016) The Professional Regulation Commission (PRC) officially released the room assignment for Sunday, March 20, 2016 Teachers Board exam or Licensure Exam for Teachers (LET) scheduled in at least 17 testing centers nationwide. The examination will be administered in Manila, all regional offices (including Cebu, Baguio and Davao), Zamboanga, Bacolod, Antique, Rosales (Pangasinan), Jolo (Sulu) and Tawi-Tawi. Based on resolution No. 3 Series of 2016, PRC has added Jolo, Sulu and Tawi-tawi as additional testing centers for March 2016 LET in reference to the request of Sulu and Tawi-tawi governors to consider their provinces in the list of test locations. The full list of room assignment for elementary and secondary takers is now available online several days before the examinations. Like Us on Facebook, follow us on Twitter to receive more updates for the upcoming LET. 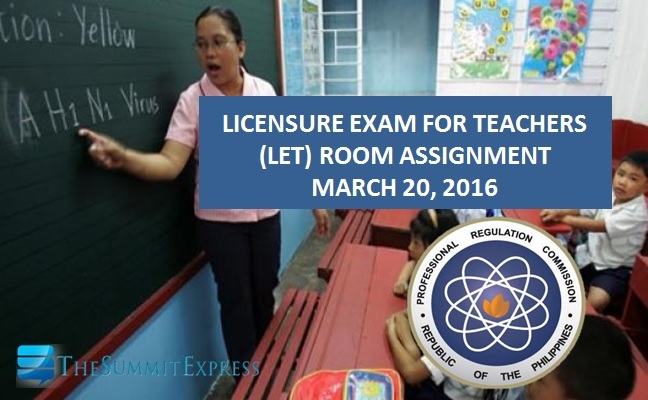 The Summit Express will also provide on this page the probable release date of March 2016 LET results.